The rooms need a serious overhaul Feels like I live in King Aelfred’s times The washbasin taps are from another era No central heating Good thing is great people out to make the stay comfortable- Vijay Pamana and Alankrita were top notch ad went above the call of duty. Thank you. Lovely Hotel, great location, could do with the décor updating, a little tired looking, staff were very helpful, we really enjoyed our couple of days. Dear Derrick W I’m so glad that you had an enjoyable time during your stay at The Mercure Hotel Winchester Wessex. I will discuss your comments about the service at the bar with my Food and Beverage Manager and I hope we can welcome you back to the property in the near future. Kind regards, Eric-Enno Snel General Manager. As a regular guest to the hotel I have a few observations that I would like to highlight. The staff are very nice and helpful without a doubt, and often go that extra mile to make my stay comfortable so well done to the reception staff - Kristyna and Viktoria in particular are very helpful, accomodating and lovely ladies in the team, Very helpful Manager - Vijay and GM Eric too. Perhaps this may be sited as the only reason for my rating here as satisfied and why I return back. However, the property is in desperate need of a revamp and looks very tired, its dated and well used now, begging for a change in furnishings and modernising. Walk in showers are much preferred to baths, sofas need an upholster as they are sinking in, and can't really sit comfortably without being guided by the sinking foam on autopilot, to one side, some beds are very hard with no topper in place, so quite uncomfortable to sleep without getting a backache. The a/c's don't work for almost 8 to 9 months that I have stayed now since 2018, in several rooms since last summer- be it in the classic, executive or privilege rooms that I was in, the showers are often not functioning well across the rooms I have stayed and hence, I had to be moved to another room, toilets are old and need a real overhaul as they don't work properly. I was kindly offered table fans which at least made the room a bit cooler, but is really not the repeated experience each stay, I am hoping for. I think the restaurant menu needs a revival too and more options included in it, the starbucks at the bar option is a welcome add on, which is good. A fridge in every room would be much appreciated esp to chill water or keep fruit and have in the early morning if I wake up. Lovely to have courteous staff all through the hotel, but sometimes that is not enough, to over compensate the inconvenience for extended periods of time with the other things around that don't work as well. A few points to make note is to have enough towels, hangers for the guests checking in .. I have to usually request for a second set of towels for two of us. Coffee is not topped up everyday, sugar satchets too few and not topped up, ensure the topper of mattress is in place. A pair of highball glasses in the room. There are only 2 mugs and not a single cup and saucer in sight. I also think the rates charged for a 4 star of this level of comfort, is quite high compared to Mercure in SouthHampton. A few areas that must be attended to - proper working a/c's and toilets, a fridge in every room, more plug points in the room to connect a kettle and laptop and devices - often I have to ask for an extension cord, as I have devices to charge and there are not enough plug outlets. Lamps are tilting in some rooms or don't come on. Friendly, super helpful staff. Rooms need upgrading. 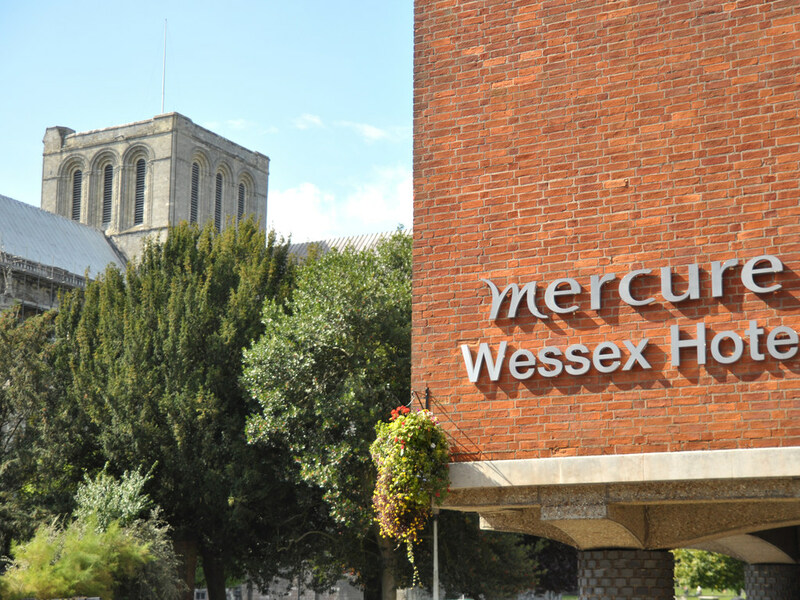 This was our fifth visit to The Mercure, Winchester as it is so conveniently located for our favourite walks and restaurants. The rooms have always been pleasantly decorated and the beds comfortable. Unfortunately on this visit we were given a very dated room with a four poster bed. The bed was comfortable and the room was clean, but the walls were in desperate need of painting and paint was peeling off the bath and ceiling.The fabrics were dated and faded and the towel rail did not work. The room was also cold. The staff were friendly and helpful, and the buffet breakfast was good value. I do think that £12 to park in the hotel car park is very expensive. One of the most comfortable beds we have ever slept in, beautiful view of cathedral, spotlessly clean room. We were in room number 228 which is next to a entrance door to the rooms. This door squeaked so loud every time it was opened and the a bang. The was continuos traffic until 2am an th then started again at 6am. I hardly slept. I reported this to the reception the next morning and they went up and agreed the door was very noisy. Very disappointed that this was not picked up by maintenance. Also for a 4 star hotel there could have at least been a biscuit to have with tea in the room. Never stayed in a 4 star that never had. The breAkfast was also disappointing for a 4 star. The waffles were very hard. Definitely not worth £15.95. Overall not a good experience and I will not be staying in a Mercure hotel again. The staff member at check in wasn't rude but she wasn't very friendly, her colleague the next day was lovely and eager to please. I thought I had booked a room with a proper double bed, as per the photo, but it was two beds pushed together - with a very hard line where they connected. I partly chose the Executive double room as I thought I would get a proper double bed. I thought the room would be smarter and with a bit more shine, I have paid less at other hotels for nicer, more cosy, more appealing rooms. I wouldn't go for a Mercure again based on this experience. Friendly, efficient, clean and comfortable. Nice hotel but room 121 was very noisy from the sounds of whirring hotel machinery underneath which woke me at 0500 hrs and rather spoiled the stay. I don’t understand why machines need to be running at night.